Can I restore mistakenly deleted files? About 30% of data loss issues are the result of human error: more often than not, the fact of mistaken deletion goes unnoticed by the user and becomes apparent only when it is already impossible to recover deleted files from the Recycle Bin or Trash – a temporary storage which keeps removed items for a certain period after the expiration of which it gets automatically emptied. In some cases, users delete files with the help of the command line, the Shift+Delete shortcut or using some third party applications, which directly take them out of a hard disk drive without sending to some temporary location. Anyway, even if one cannot find deleted files by standard means of the operating system, it doesn’t necessarily mean that they are permanently destroyed. Although each OS has certain specifics with regard to this process described in Peculiarities of data recovery depending on the OS, as a general rule, they make a note that the files are no longer needed and the space occupied by them is available for use. However, the data itself is present on the disk until some other information is written over it which enables the user to restore deleted files with the help of a specialized utility. First and foremost, to successfully recover deleted files from your hard drive, SD card, flash drive or any other external storage medium, stop writing data to this very storage. In case of an internal disk of a PC or Mac, data recovery should be started as soon as possible as even operations like system boot, software installation, documents editing, video streaming, etc. may cause their overwriting. Newer NAND flash-based Solid State Drives support TRIM which is a special command invoked by the OS each time the user deletes a file. Its purpose is to notify the SSD that certain blocks of data are no longer in use and the memory cells occupied by them can be safely wiped to get ready for being filled in later. Most operating systems are set to activate this feature by default when they detect that a volume is mounted on an SSD. TRIM makes SSDs much faster and contributes to their longer life, but, at the same time, makes it practically impossible to restore deleted files from an SSD with enabled TRIM. The only possibility is to use that short period when the operation is deferred until the drive gets idle. If the files to be recovered were stored in some directory of the computer’s system partition, for example on the Desktop or in User Documents, the computer should be turned off at earliest possible time, as the operating system may utilize the “released” storage space for its own needs, overwriting the deleted files and thus permanently destroying them. After that, the disk should be extracted from the computer and attached to another machine as a secondary storage or the same PC may be booted in a safe environment with the help of a removable device with a preinstalled bootable OS. This excludes the background writing of system files to the problem volume. Large files, especially the ones created gradually, are very likely to be stored inconsistently on a drive – this issue is referred to as fragmentation. 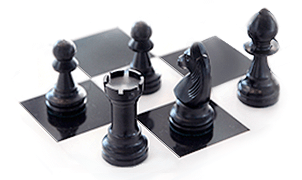 Fragmentation significantly diminishes the chances for complete recovery of files as the probability is usually inversely proportional to the number of fragments a file is broken into. Files of certain types, like images or videos, in some cases can be still opened and partially viewed even if a fragment is missing, but usually, most files become corrupted and thus useless. 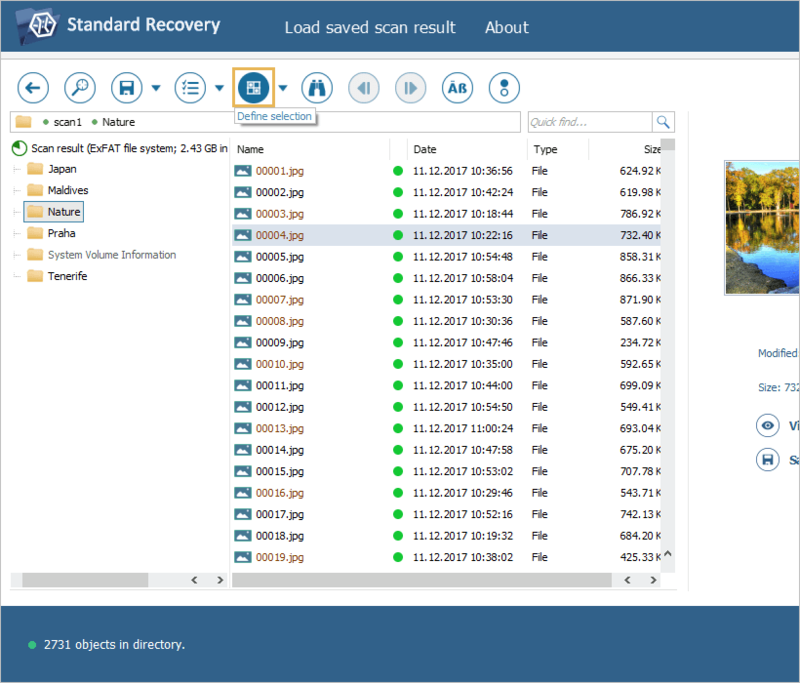 Among all the methods intended to recover deleted files from a digital storage, SysDev Laboratories recommends UFS Explorer software as an optimal solution for dealing with such cases of data loss. 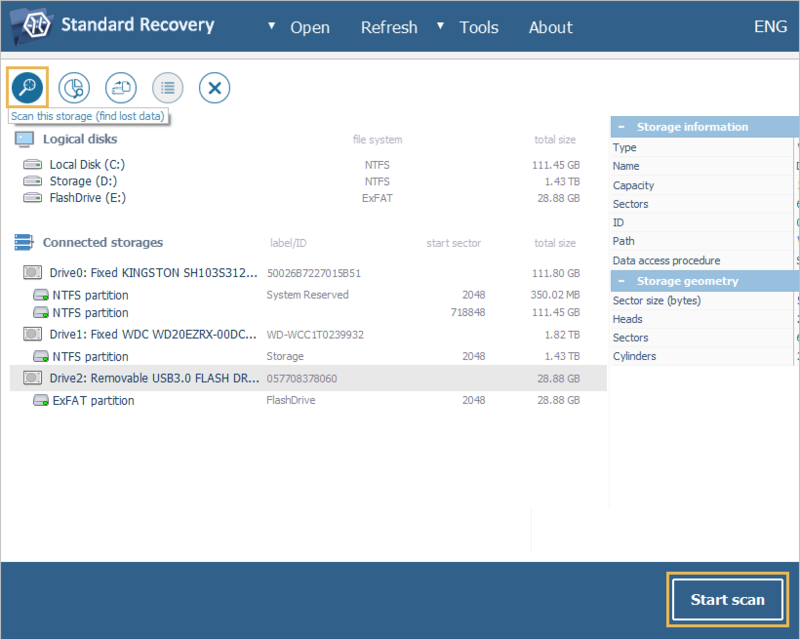 The product range includes utilities for work with a great variety of storage devices, from common storage media to complex RAID, each featuring a combination of a powerful scan engine and sophisticated data recovery techniques while UFS Explorer Backup and Emergency Recovery CD serves as a safe environment for cases of emergency data recovery, when there is a high risk of data overwriting. 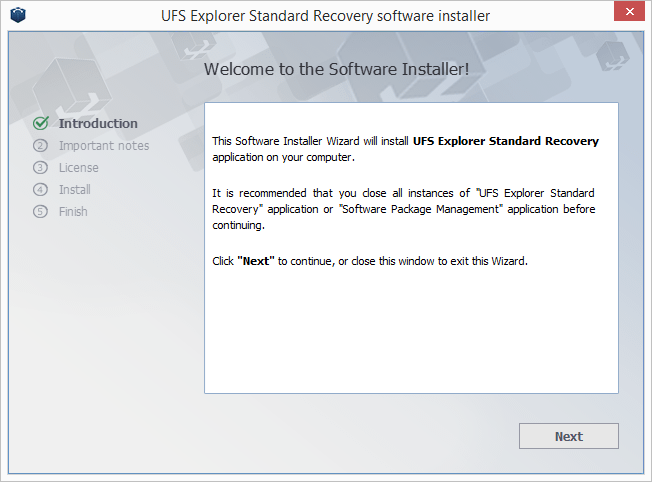 Download and install UFS Explorer onto the disk other than the one holding deleted files you are going to recover. Make sure that the downloaded version of the program corresponds to the operating system platform it will be run on. Run the application and adjust the software settings in the settings sheet, if needed. Connect the storage device which contains the deleted data you need to get back. You may choose any type of direct connection valid for your device type. 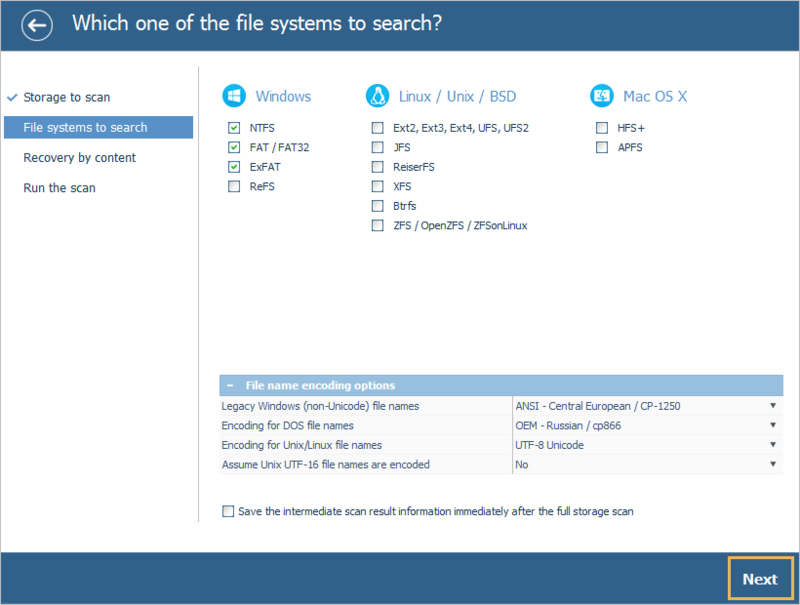 Select the problem device or a logical volume in the list of connected storages in the left pane of UFS Explorer and scan it for lost data using the corresponding button or the storage context menu option. Set up the needed scan parameters. You may disable InelliRAW if you want the process to be completed faster. Press the “Start scan” button and wait for the results. 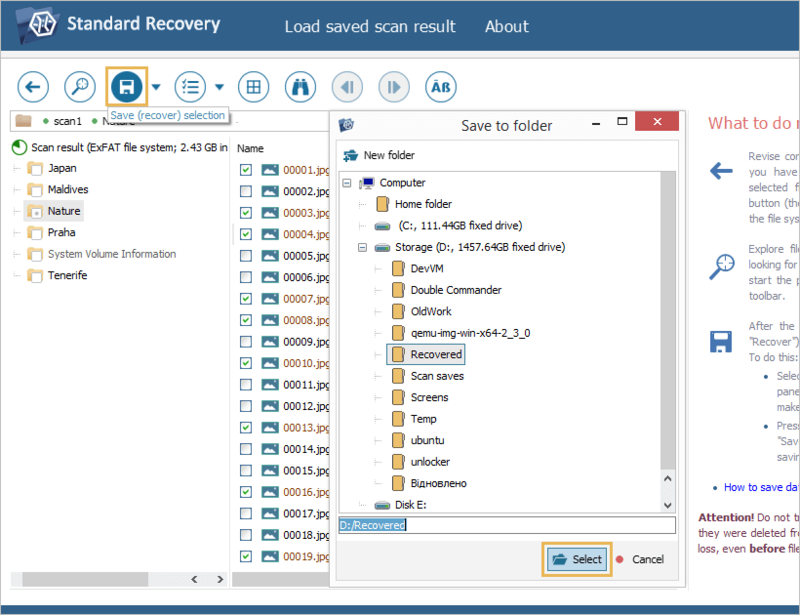 Browse the files found by the program and select the ones you want to recover. You may sort them by name, date, type, use the quick and advanced search options as well as preview them in the internal viewer. Save the selected files to a spare drive, external storage or a network location. The target storage must be other than the disk from which the deleted data is being recovered. Other details will depend on the operating system you use, type of the device or in some cases, the format of deleted files and are presented in the corresponding articles.